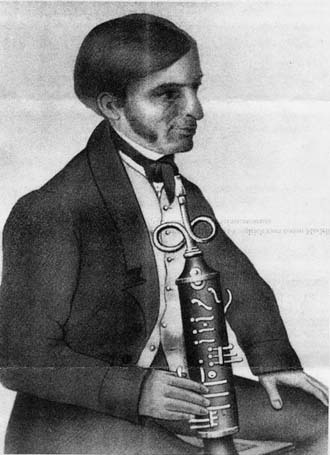 Pictured above is the psallmelodikon, with its inventor Johannes Weinrich. Weinrich, a writer and shoemaker from Heiligenstadt, Germany, was awarded a patent for his instrument in 1828. The psallmelodikon consisted of a brass tube about a foot long, with six fingerholes and 20 keys and a set of silver alloy free reeds that gave a range of just over two chromatic octaves.